While myopia continues to be studied, it is apparent that both nature and nurture are involved in the cause and progression of myopia. It is very likely that genetics play a role in myopia with genes calling for a certain shape eyeball. This is evident in that children of nearsighted parents tend to be nearsighted as well. However, genetics alone can not answer for the fact that the prevalence of myopia has increased dramatically in our society. There is likely an association between myopia and a combination of an increase in near vision activities and the decrease in outdoor activities. Near vision activities (including reading for pleasure/work/studies and the use of hand-held devices) is likely associated with myopia. In contrast, some studies have indicated that more time doing outdoor activities is associated with less myopia. This may be due to looking at distance more than at near and/or exposure to brighter light that may have positive diurnal (daytime/nighttime cycle) effects on eyes. Another theory is that if light is focused behind the retina (the nerve lining inside the eye that absorbs light and allows vision) in the areas peripheral to the macula (the central, detail-vision part of the retina), the eye has a mechanism to grow longer to try to get the retina in line with this peripheral light. This can result in an eye continually growing longer and thus becoming more myopic, even if light is focused on the macula for clear vision using progressively stronger glasses or contact lenses. This theory may be the main reason why near vision activities are associated with increasing myopia, and why Orthokeratology and Soft Multifocal contacts can help slow myopia progression. Here are the methods currently thought to help slow the progression of myopia with the intent of reducing future amounts of myopia (not current myopia) and risk of myopia-related conditions. - Daytime outdoor activities. As mentioned above, more outdoor, daytime activities are associated with less myopia progression. At this point in time, researchers are not sure what causes this association. It may be simply due to more often looking at distance instead of up close. There may be diurnal, circadian rhythm (24-hour daytime/nighttime cycle) effects on eye growth. Or it may be due to a combination of these and other factors. - Read at about arm’s length, roughly 18-20 inches, not closer. This also applies to other close vision tasks and activities. It is common for children to hold their cellphone and other devices close to their eyes. Please remind them to view these devices at roughly arm's length. - Atropine. Atropine relaxes the focusing mechanism in the eye. Studies using even dilute (0.01%) atropine at bedtime indicate a likely reduction in myopia progression. This can be prescribed by Dr. Hall, and needs to be made at a sterile pharmaceutical compounding facility. - Orthokeratology. Rigid Gas Permeable contact lenses are specially designed to reshape the cornea while sleeping. After this corneal reshaping, distance vision is quite clear without glasses or contact lenses. The effect is temporary, so lenses need to be worn overnight every night, like a retainer lens. - Soft Bifocal/Multifocal Contact Lenses. Certain designs of soft bifocal/multifocal contact lenses worn during the day can reduce reading eyestrain and focus light peripheral to the macula in front of the retina (instead of behind the retina). - Bifocal eyeglasses. There is some evidence that bifocal eyeglasses can slow the progression of myopia, but likely less of an effect than the above methods. Also, do not under-correct eyeglasses. Not only does under-correction of a nearsighted eyeglasses prescription cause blurry distance vision (with likely adverse effects on safety, sports and school work), this may actually cause an increase in myopia progression. For adults who are becoming more myopic, it is possible that myopia control measures may be beneficial. However there is currently insufficient research to give advice in this regard. 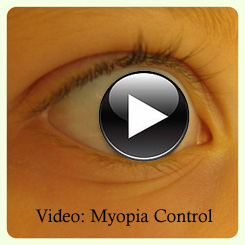 Dr. Hall has been interested in the topic of myopia control for many years. Along with following the clinical trends and research on myopia control, Dr. Hall has had multiple conversations on this subject with Dr. Jeffrey Walline, an influential professor and researcher at Ohio State University. Dr. Walline is currently conducting a myopia control study with the use of multifocal soft contact lenses for the National Eye Institute. Please make an eye exam appointment for your child with Dr. Hall to discuss Myopia Control specifically for your child. Myopia Control - A Cure for Nearsightendness? To inquire about Myopia Control further, please call our office at (707) 570-2418.